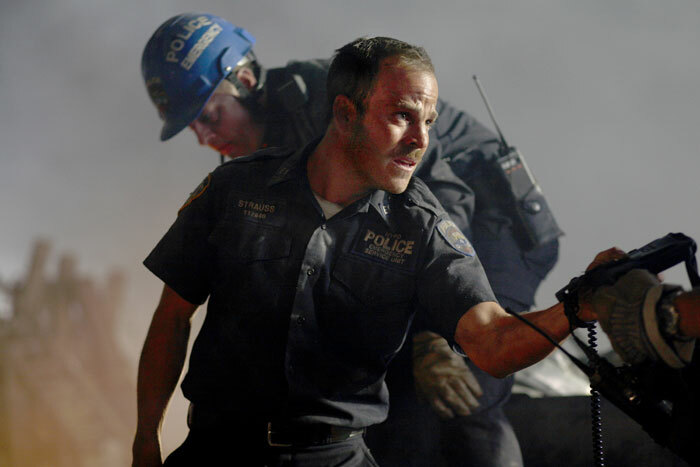 Stephen Dorff plays a rescuer in Oliver Stone's "World Trade Center." Reading today's critical responses to Oliver Stone's "World Trade Center," I find it fascinating that the positive reviews and the negative reviews are saying essentially the same things. People have interpreted the movie in different ways, as a disaster picture and as a political picture, but if you look at the specific observations about the film, it's not as easy as you'd think to distinguish the favorable notices from the unfavorable ones. One of my friends (also a film critic) who was favorably impressed said she thought the portrayal of the heroic Marine at the end was sad, because he was deluded into thinking the war in Iraq was about avenging 9/11. I don't know if that's what Stone intended. I didn't see it that way. But it's a legitimate interpretation of what's up there on the screen. And make no mistake, this is a political movie. It makes choices about what to show and what not to show (including worldwide reactions on television), and in 2006 those choices in a film about 9/11 can't help but be political as well as dramatic or cinematic. 1) ['WTC'] wields a simple, blunt emotional instrument. It is a film about an American tragedy done up in the trappings of honorable, well-meaning melodrama.... 'World Trade Center' is the second major studio picture to weigh in on the events of Sept. 11, 2001. It is a more limited achievement: a comfortably unsettling drama." 2) "In this screen version of the Sept. 11 story, however, we see only two people die, the same number that the movie shows being rescued. By creating a kind of equivalency between the living and the dead, the picture always feels as if it's laboring to arrive at a Hollywood ending. 'World Trade Center' delivers to its audience a calculated dose of uplift and gooses us along to feel suspense here, compassion there and hope at the end." 3) "The filmmaker and his colleagues have brought the sensibility of an old-fashioned Hollywood disaster movie..."
4) "Stone's film bears some thematic resemblance to 'Alive,' Frank Marshall's 1993 chronicle of a plane crash in the Andes. Both offer a tribute to human endurance under unimaginable conditions, but watching young guys huddle together trying not to freeze to death or two cops pinned under tons of debris isn't exactly a cinematic thrill ride." 5) "Attempting to convey a macro vision of Sept. 11 through a micro lens, Oliver Stone is to be credited for presenting this challenging, fact-based story with admirable restraint, a quality that has not always characterized his past directorial efforts...."
6) "'WTC' is not a definitive statement about 9/11, or one that is likely to make you see that day any differently than you do now. And there's nothing wrong with that." 7) "The surprising thing about this commission job, directed from Andrea Berloff's script, is not its factuality but its restraint.... As befits a new-style disaster film, spectacle is subsumed in subjective experience—in this case, being buried alive." 8) "Stone has dutifully repeated his studio-given mantra that 'World Trade Center' is "not a political movie." (As if that were possible: Even the musical cues suggest the mawkish piano doodling that's been a campaign ad staple since Reagan ran for re-election.)" 9) "In some ways, it's a typically unsubtle Stone movie. Stone can't show New Yorkers (civilians as well as firefighters, policemen and Marines) helping one another through the disaster without later adding a voiceover about how everyone helped each other that day.... Over and over in "World Trade Center," Stone acknowledges the importance of showing, as opposed to telling, and then goes ahead and tells anyway." 10) "It's impossible to watch Oliver Stone's 'World Trade Center' without being moved.... Although 'World Trade Center' doesn't fuel anyone's political agenda, it lends itself to the kind of romanticized view of ordinary men that found its way into 'Platoon.' Stone can't conceal his admiration for these salt-of-the-earth cops." 11) "For the reality of what took place on the streets of Lower Manhattan is such an overwhelmingly sad and troubling story that simply re-creating those horrific events, as this film does, guarantees that your work will have moments of power and emotion. A person's heart would have to be made of stone if he or she weren't at least a little affected by the against-all-odds rescue of two Port Authority policemen, played by Nicolas Cage and Michael Peña, from beneath crushing piles of rubble, as their despairing wives, played by Maria Bello and Maggie Gyllenhaal, cry literal tears of joy." 12) "The unthinkable has happened. Oliver Stone has made a film that is unrecognizable as an Oliver Stone film.... Most of all, it exhibits no political slant whatsoever, injecting only heartfelt empathy for the day's many victims and heroes." 13) "The films of Oliver Stone are the ongoing cry of a distressed romantic. Romantic, because the best of them are animated, and the worst marred, by the same simple dialectic of good versus evil.... Here, evil is a 'yeah, sure' given, unnecessary to cast and too obvious to show as anything more than a plane's fleeting shadow, hovering above a valley of death where goodness and mercy abound. Such is the heroic myth that now permeates the hours of that fateful day." 14) "As a tribute to those who died, and survived, on Sept. 11, World Trade Center is a scrupulous and honorable film. Yet it never comes close to being a revelatory one; it sentimentalizes more than it haunts." Next Article: Best Mel Gibson joke yet Previous Article: 'World Trade Center': How political is it? 'World Trade Center': How political is it?